After outgrowing their shared space at the Brenner Builders offices, it was time for Healthy Home to find a space of their own. In the Spring of 2013 we renovated a 1920 barn into a modern, net-zero energy use office and warehouse. The building is energy efficient, and gets its electricity and heat from the sun. In the photo above, the solar thermal panels are on the left and the photovoltaic panels are on the right. The existing building was stripped to its roof rafters, wall studs and dirt floor to facilitate the installation of a continuous thermal and pressure boundary. This will insure that the outside air stays out and the inside air stays in. The solar thermal energy begins with the power of the sun heating tubes in the panels on the roof. This heat energy is stored in 4-100 gallon super insulated tanks and distributed via the radiant heat tubing (pictured above) in the concrete slab. 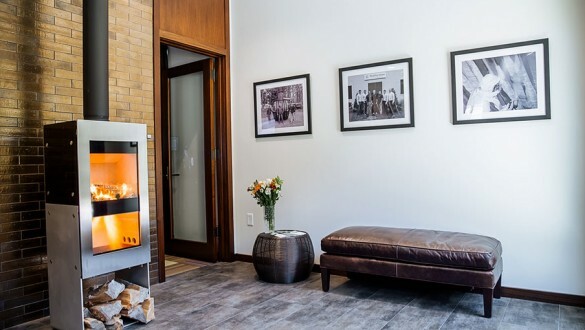 As a supplement to the Solar Thermal radiant floor heating, this 96% efficient twin-fire stove glows in our office lobby. Unless you monitor and verify energy consumption and production, calling a building net-zero energy means nothing. Our custom designed, web accessible dashboard monitors performance real time. Our dashboard’s homepage is pictured above. Since our only energy production is via our solar photovoltaic system, we monitor the electrical production and consumption continuously. At the moment that this image was captured we were producing 8,778 watts, consuming 1,513 watts and selling 7,179 watts back to the grid. Reducing our water usage is a key component of green living. All the rain water coming off the roof is collected in an underground 1700 gallon cistern. This stored water is used for irrigation during the high demand months of July and August. The cistern is meeting its final resting place in the photo above. Of course no self-respecting green energy company would be without a fully electric vehicle powered by a solar PV system. Above, Chris Mari is tooling around town in our Healthy Home electric Smart Car.